This beautiful brown wood bead Stations of the Cross Rosary (actually a chaplet) contains full color representations of the 14 Stations of the Cross illustrated on each interlocked full-color oval pendant, concluding with the Resurrected Christ centerpiece. Each of the 14 station medals have the station number engraved on the back and are separated from each other with three smaller beads. The resurrection is featured at the center. The crucifix is very unique in that it also depicts God the Father and God the Holy Spirit along with the crucified Christ, thus representing the Holy Trinity. The Way of the Cross is a wonderful prayer and meditation on the Passion of Christ that is ideal for a Friday penitential practice, especially during Lent. It is intended to roll around as you pray and sometimes you will be able to see the number, other times, you are able to see the picture. My good and dear Jesus, I kneel before you, asking you most earnestly to engrave upon my heart a deep and lively faith, hope, and charity, with true repentance for my sins, and a firm resolve to make amends. As I reflect upon your five wounds, and dwell upon them with deep compassion and grief, I recall, good Jesus, the words the prophet David spoke long ago concerning yourself: ‘They have pierced my hands and my feet; they have counted all my bones! Lord Jesus Christ, your passion and death is the sacrifice that unites earth and heaven and reconciles all people to you. May we who have faithfully reflected on these mysteries follow in your steps and so come to share your glory in heaven where you live and reign with the Father and the Holy Spirit one God, for ever and ever. Amen. The Stations of the Cross Rosary is a beautiful addition to my Daily Lenten prayers. I am so pleased to have this rosary. It makes it much easier to pray at home. The only suggestion I would like to make would be to make the pictures of the Stations more vivid. Overall, I am quite happy with this purchase. A beautiful rosary. My only suggestion is to print out the prayers inside the included box. I was struck with the beauty of this Stations of the Cross Rosary. But our Priest, Father John, could not believe how beautiful it was as He blessed it. It was a gift for me to do Stations during this Lenten. season. Thank you!!! I was so excited to see this in the catalogue. I sometimes say the Stations of the Cross at Adoration - sitting in front of Our Lord, and this rosary is perfect for that devotion. This is a gift for my older daughter and she will be so thrilled. She asked for it and I want one too. It is so very beautiful. I purchased this rosary to use during the Lenten Season. I found it larger than I expected. It is well made and I like the Trinity Cross. It should have a small laminated prayer card of directions in English with it. Fortunately the directions can be copied from the web site. I ordered this as a birthday present for my mom. She was very pleased with it. The only thing that I would suggest is a booklet on how to pray the stations of the Cross. There was a small pamphlet included but was much too small for her to read. This is so beautiful and well designed. The Crucifix took my breath away, portraying the Father, Son and Holy Ghost. My only complaint would be that some of the pictures were not vivid, and because of the size, were difficult to see clearly. This Rosary will be put to good use! Beautiful rosary in brown wood. The pictures depict the stations of the cross. I am so happy I ordered the rosary. Workmanship is beautiful. I would recommend this to anyone. The pictures are a little hard for me to see as I am an elderly person but anyone would enjoy the beautiful work that has gone into it. Perfect timing for Lent!! I pray the stations of the cross daily, and I find the rosary incredibly helpful during my prayer time. It's beautiful, and an easier way to say the stations than reading them from a booklet when I don't have the time. Perfect for this Lenten season, now I can do the stations of the cross at any time, use it just like a rosary, I really like the Holy Trinity for the Crucifix. This stations of the cross rosary is beautiful and very well made. Stunning rosary and very good quality. Looks exactly as pictured. Always happy with my purchases from The Catholic Company. This Rosary is so beautiful. The Cross shows Father, Son and Holy Spirit. I had this beautiful Sacramental blessed today and will be using it often. My only wish is that the prayer routine on it would have been included. I received today my Stations of the Cross Rosary in Brown Wood and it is beautiful. I can see myself purchasing a couple of them for birthdays this year. It is exquisite. This is a lovely way to go through the Stations of the Cross for those who want to make this devotion in their home. Am buying another set for my sister! This Stations of The Cross Rosary is beautiful and well made. I purchased this and 3 other Chaplets. They are all well made and beautiful. Sorry to repeat myself, but it is the way I feel! I am a first time customer and very happy with these purchases. Thanks again for making such quality products. 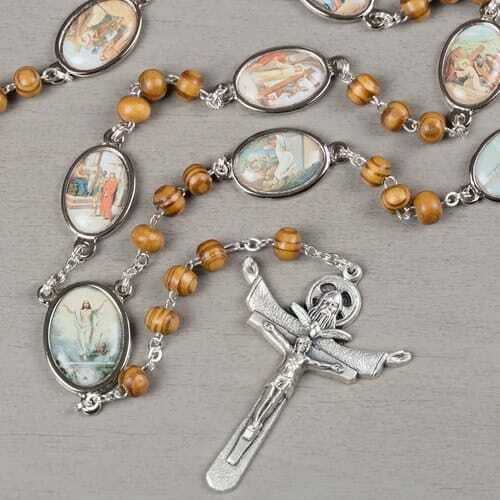 I read the reviews, hoping this rosary would live up to all the great comments. It did! It's so unusual (none of my friends had seen anything like it), and the quality is very nice. It'"feels good." The medals are beautiful, and are a good reminder of what the Stations really mean. Please note that it's not said like a regular rosary. I HAD YOU SEND BOTH ITEM TO BRISTOL VERMONT FOR MY SISTER WHO WAS IN SERIOUS CONDITION. SHE IS 89 AND I WANTED HER TO HAVE IT FOR EASTER. I HAVE NOT HEARD FROM HER ABOUT THE CD BUT SHE WAS ESTATIC ABOUT THE ROSARY. I WOULD GIVE BOTH ITEMS ALL 5'S AS THELMA IS PICKY AND WHEN SHE IS HAPPY THEY MUST BE GREAT. THANKS FOR BEING HERE FOR ME TO CONTINUE PURCHASING ITEMS. I recently purchased this beautiful rosary. I have had no issues of any kind with it. This is a well made product that I use daily. I highly recommend this rosary. Use this rosary and draw closer to Our Lord through His Passion. Thank you Catholic Company. This is a beautiful and very detailed rosary but the chain links are somewhat cheap and get very tangled at one end--makes it very difficult to hold the rosary without problems. This rosary is beautiful and a wonderful way to pray the stations of the cross whether you are in a church or at home. Also recommend the DVD "The Via Dolorosa Experience" that you can use with this rosary as an added devotion. I have been wanting this station of the cross rosary for some time. It's beautifully done with smooth wooden beads which I prefer. This picture of the statons are lovely as well. Happy with purchase. Beautiful Rosary and outstanding quality. Having the Stations of the Cross within reach to pray anytime is a blessing. I ordered two of them and the recipient of the Rosary thanks me every time we meet for giving her this special gift. It is beautiful! It's beautiful and well crafted. I would recommend it. I love this Stations rosary. I love the little pictures for each station. It helps me focus on the meditation. Love them but wish you sent instructions with them. Have they been Blessed? They are Beautiful rosaries. It is not permissible to sell blessed objects, so none of our items are blessed. We encourage our customers to take the items to their parish priests to get blessed. Also, since the Stations Rosary comes from Italy, the instructions in English are not included with it. However, we have added the instructions above; look beneath the product description on the item page. This way our customers can print off the instructions. I am very very satisfied with this high quality Stations of the Cross Rosary,... it is beautiful in every way!... love it! This Rosary/Chaplet is wonderful. When you can't get to Stations at Church, you can still participate in your home with this beautiful chaplet. I am so thankful for this Stations Rosary. I am disabled and usually not able to get to Church other than the Church bus for Mass. Now I can say the Stations at home easily. And it is so beautiful and easy to hold and use! I had never seen or used this rosary for the Stations of the Cross, so I bought three and gave two to my relatives. Besides loving the looks of it, we find that we can say the Station of the Cross anywhere and anytime. I have gotten many compliments on it. I told them where I purchased it and they said they were going to get one. I love the stations rosary. I use it when I go to adoration chapel. Only thing you should have the directions as part of this item. Since the Stations Rosary comes from Italy, the instructions in English are not included with it. However, we have added the instructions above; look beneath the product description on the item page. This way our customers can print off the instructions. This stations of the cross rosary is absolutely beautiful and of the highest quality. Using this rosary is is such a beautiful, intimate way to be a part of the passion of Jesus Christ. This Stations of the Cross Rosary is beautiful and just what is needed especially during this Lentan season. It not only makes it easy to pray the Stations of the Cross but because of its ease, offers encouragement to do so. Will continue to be very useful even after Lent. I am glad I made the purchase! This came at such an opportune time. I decided to pray the Stations at home on Fridays during Lent, instead of driving to Church at night. I've been using "different forms" of the Stations. This has been great--a combination of two devotions into one. I have taken this with me to a couple of places and shown my friends. I love my new rosary. I brought it to church last Sunday to show my friends and no one had ever seen such a rosary. I even brought it to "Mercy of Divine Chaplet", today and none of them had ever seen such a rosary. They all wanted one, so I passed around your catalog and many of them wrote down numbers etc. So lets hope you get many orders for more. Thanks so much. A satisfied customer. The stations of the Cross rosary - Brown Wood was a recent purchase and cannot say enough good things about it, truly beautiful and encourages me even more to say the stations of the cross. The picture does not do it justice. I love the way the pictures look 3-D. I tip it left or right and it looks like I can see behind something in the foreground. Nice size too. I truly enjoy the Stations and the Passion of our Lord. I have been looking for somsthing i could use tu see and touch as i said the Stations outside of a church, such as home work or the park.after some deliberation and waiting for Gods Will, I came back to this form of a rosary. It has been convienient and truly helpful with my devotion to the Sations. I love the size of the round beads. They feel comfortable in my hand as I meditate the stations. I would have given it a 5 *, but too small and only partial instructions of the prayers are provided. I highlited the prayers in the description and printed them out, no booklets I found have the opening or closing prayers. Because these rosaries ship right from Italy, there are no English instructions included. So we have the Stations of the Cross rosary instructions/prayers listed right below the product description on the website. That way any customer can copy the content for personal use. Thank you for the Stations of the Cross Rosary. Praying the Stations has always been one of my favorite devotions. Because of health conditions I can't always make the service at church. Now I can pray this beautiful devotion "anytime or anyplace." The crucifix is stunning! I am very happy doing business with the Catholic Company! I love my rosary. My only suggestion is that a Product Description of the prayers associated with this rosary be sent with the Stations of the Cross Rosary. Beautiful and feels good in the hand when praying but had to go to the web to get directions. Really should have included method of saying the chaplet since I cannot print from the web. Honestly, the pictures online don't even do this rosary justice! It's even more beautiful in person. My dad actually ordered this for me for my birthday, and I must say I really love it. The size, texture, and quality of the beads is just perfect. It's easy to use, and the images are very moving. This Stations of the Cross Rosary is really an essential tool for anyone's prayer life because it really helps you to connect with and appreciate the passion of Jesus Christ. These are the prettiest, well make, rosary I have purchased in a long time. The pamphlet that was with them explaining how we should pray this rosary is very helpful. For anyone dedicated to the Stations of the Cross, these are a beautiful gift for yourself, a loved one or a best friend. God Bless Us! This is amazing, to say the Stations is good, now to have this Rosary too, it just adds so much. Thank the person or persons that came up with this idea. Good job! God Bless everyone. I LOVE this Rosary! I use it with Mary's Way of the Cross. This is a wonderful way to pray the Stations of the Cross when you can't attend a service. The rosary is absolutely beautiful. If I could make a suggestion, it would be to add a prayer guide. However, there are many apps available on a smart phone to aid in prayer. This is a nice gift for someone who is unable to walk the Stations of the Cross. Each Station is beautifully depicted. No words are necessary, just look at the picture and meditate on each station. A small booklet is included. I am very happy with this rosary and it's big and easy to hold. Smooth and has weight. A beautiful rosary, I found it very convenient to pray the stations with my 9 year old. I gave one to my 93 year old grandma as well, and she loves it too. I am so glad I bought this Stations of the Cross rosary. The pictures are so beautiful and help with your meditation. Most importantly, my church skips over the prayers (Our Father, Hail Mary, and Glory Be) that should be said with each station. It's the abbreviated version in today's fast world--no one has the time or patience any more unfortunately. So with this rosary, I can move through the stations by myself and take my time and really meditate on each one and say the required prayers too! A wonderful rosary with beautiful pictures. I cannot express in words how beautiful this Rosary is in both content and meaning. My friend at church was so taken by seeing mine, that I helped her in securing her own from The Catholic Company. This is a wonderful addition to making our Lenten devotion more meaningful. The only recommendation that I have is to include a readable card or document that has the prayers that are to be said. I made a copy of the promotional material that was e-mailed to me that had the explanation. I then created my own document that included that names for each of the Stations. The Stations of the Cross Rosary is a great way to say the Stations and reflect on them throughout the year. Fabulous and beautiful as well ad well made. excellent. went on line to copy the prayers for each station. wonderful devotional. This rosary bead is very well made and very unique. It is very nice to be able to visualize the stations in any environment and then to have the beads for the Our Father, Hail Mary, and the Glory Be present. I would recommend this product except for its price. It would be nice to have a more affordable price. Thank You. I'm very happy with my purchase. I have a rosary collection and it is a beautiful addition but I use it too. I love the Rosary and the Stations. This Rosary gives me something tactile to hold as I pray and I find the weight to be just right to help me to stay focused on what I am praying. This is so beautiful, doing a series of Our Father, Hail Mary, and Glory Be to the station reflections---gorgeous. I only wish the printed material was larger and easier to read. My wife and kids love these beads, especially during Lent when we attend the Stations of the Cross on Fridays...I will definitely be buying more. I can't always get to church for the Stations, so this Rosary is PERFECT! Great quality, and will be passed down to my family. ONLY CON: The prayers to be recited SHOULD BE printed on a card (Holy Card - definitely larger than the booklet listing the stations) and accompany the Rosary so you don't have to copy off the order page (above). This Stations of the Cross Rosary is perfect for me as it allows me to pray the Devotions since I cannot get to church to attend the church services held on Fridays.